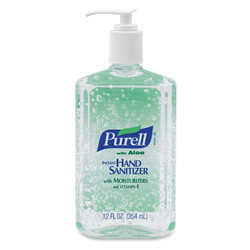 Instant hand sanitizer is essential in any crowded work environment to keep away germs. Unfortunately most instant hand sanitizers dry out your hands. This is why I love the Purell line of hand sanitizers from ReStockit.com. My personal favorite is the 12 ounce bottle of Purell with Aloe. No matter how many hands I shake or doorknobs I turn, the more I use this bottle the softer my hands get! Not only does it kill 99.99 percent of germs that spread disease, it moisturizes your skin, unlike most alcohol based instant sanitizers. Don’t kid yourself, everyone can get sick. According to a recent Center for Disease Control report, the last flu season during the end of last year and beginning of 2011 indicated a spike in illness not seen in forty years, illnesses that could have been prevented with sanitation habits such as using hand sanitizer. Purell Instant Hand Sanitizer with Aloe helps me save my sick days for when I really need them! Hi there, I stumbled on your web site from digg. It’s not an article I would regularly read, but I liked your perspective on it. Thank you for making a piece worth reading! Hello, I found your site from reddit. This isn’t not something I would regularly read, but I loved your spin on it. Thanx for creating something worth reading!